DominoPDF supports 64-Bit operating systems* with both the 64-Bit version of Domino and the 32-Bit version of Domino. For a 64-Bit Domino installation a DLL named DominoPDF64.DLL is provided in the DominoPDF installation. Wherever you see a declaration referencing DominoPDF.DLL in the documentation you should replace with DominoPDF64.DLL. No further changes are necessary and all documentation usage, sample code, etc. remains unchanged. For a 32-Bit Domino installation there are no changes needed. * Note that only the core URL/HTTP interface supports 64-Bit. The client-side API still requires a 32-Bit interface. In some cases, security settings may need to be adjusted to allow DominoPDF COM to operate. Choose: Component Services >> Computers >> My Computer >> DCOM Config >> DominoPDF COM object. The idea behind this is to tell DominoPDF to run as the currently logged in user. Alternatively, you can specify an explicit user or add one via the Security tab. 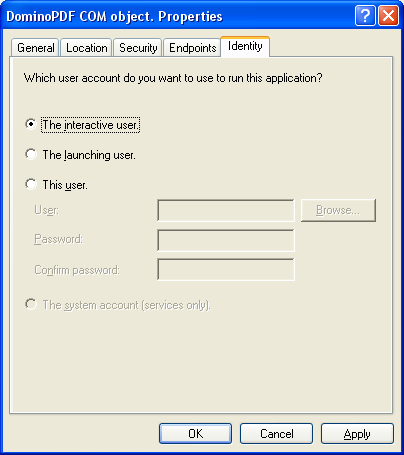 Note that instead of "The interactive user" setting you may need to add the account you are currently logged into to the DCOM setting. 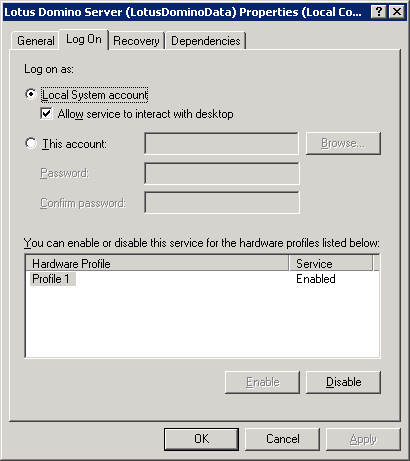 If you run the Domino Server as a service you may need to enable the Log On used to interact with the desktop. Open the Service properties for "Lotus Domino Server" and click the Log On tab. Enable "Allow service to interact with desktop".